BAGHDAD -- Militants of the Islamic State of Iraq and Syria (ISIS) have infiltrated one of Baghdad's outer suburbs, Abu Ghraib which is only eight miles from the runway perimeter of Baghdad's international airport. 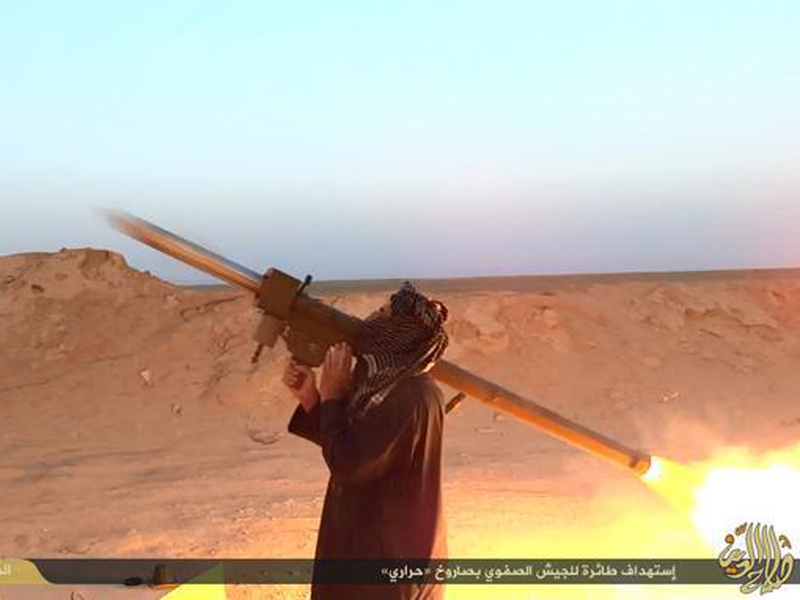 It's cause for serious concern now that the Iraqi Defense Ministry has confirmed ISIS has MANPADs, shoulder fired anti-aircraft missiles. The Iraqi army is still patrolling Abu Ghraib, but they play cat and mouse with the ISIS fighters who stage hit and run attacks on security forces. It's a mixed picture around the city. ISIS took over the city of Fallujah -- only about 40 miles west of Baghdad -- in January, and the Iraqi security forces have fought in vain for a year to force them out. Instead, and in spite of weeks of U.S.-led airstrikes, ISIS has gradually extended its reach. The extremist group is now either present or in control of a huge swath of countryside, forming a 180-degree arc around the Iraqi capital from due north around to the west, and all the way to the south. Around this zone there have been skirmishes, and occasionally heavy fighting, with Iraqi security forces and Shiite militias battling ISIS. American jets have carried out more than two dozen airstrikes in the area, mainly near Fallujah and the city of Ramadi, further to the west. Inside Baghdad itself, there are ISIS sleeper cells that carry out almost daily bombings and assassinations. An Iraqi officer told CBS News that the airstrikes are helping to clear an ISIS-free buffer zone around the city, where there are Iraqi boots on the ground. In fact, there are 60,000 men assigned to defend the capital, and CBS News correspondent David Martin reports that there are 12 teams of American advisers deployed with the Iraqi brigades. The estimate is that the Iraqi army will fight for the capital and there is no real concern that Baghdad is in imminent danger, Martin says. Still, questions remain as to whether the Iraqi are disciplined enough to put up a sufficient fight if ISIS launches a major offensive. As at least three major Iraqi military debacles have shown over the past five months -- the most stunning being the quick fall of Mosul in the north -- the army is plagued with problems of poor leadership and endemic corruption that undermine their effectiveness as a fighting force. As Martin reported from the Pentagon on Thursday, due to the relatively poor performance of the Iraqi troops west of Baghdad, the airstrikes are having a limited impact. In a clear indication of both the urgency of stopping any advance on Baghdad from the West, and in the need for precision strikes around the densely populated city, the U.S. used Apache attack helicopters -- for the first time in the fight against ISIS -- in Anbar province on Sunday. Last week, the fighting in Anbar verged on a rout of the Iraqi army, Martin reports. In the past few days the ISIS offensive has slowed, but analysts aren't sure if that's because ISIS is overextended or are simply taking an "operational pause" while they reposition for the resumption of the offensive. The militants largely control the main highway between Baghdad and the border with Jordan, to the west, and the desert surrounding it.